Lyme Tea: Blended to support and nourish your body during Lyme. Drink 2 to 4 cups every day. Lyme Support Tonic: A group of mushrooms and herbs that are cooked in a slow cooker for 2 days (you may also add an organic soup bone if you wish). Helps your immune system become stronger to rid your body of Lyme. 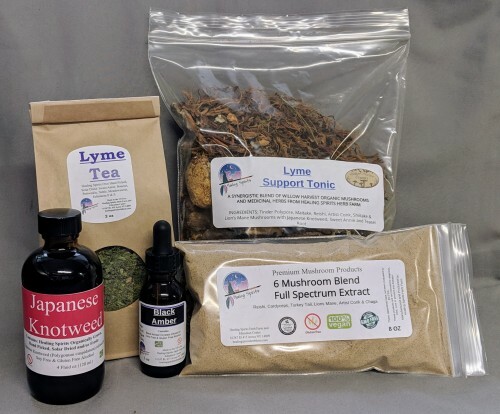 6-Mushroom Blend (Full-Spectrum Mushroom Extract Powder): Assortment of mushrooms and herbs that have been shown to stimulate the immune system and help treat the effects of Lyme Disease. Japanese Knotweed Tincture: Japanese Knotweed is broadly antimicrobial, including against spirochetes and Bartonella. It increases blood flow to areas that are often otherwise protective harbors for bacteria such as the eyes, heart, joints, and skin, and also improves the immune reaction and medicine delivery to those areas for treating local symptoms. It’s anti-inflammatory, containing a high amount of resveratrol which is the same compound researchers claim is the main antioxidant in red wine, aiding its compounds to get through the blood brain barrier (Stephen Buhner). Black Amber: Creates a vibrational field that is uncomfortable to the ticks and helps detour bites.